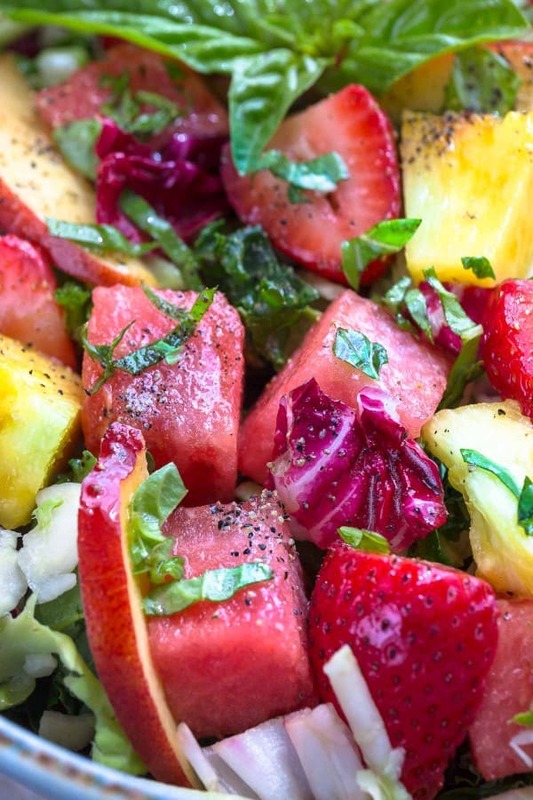 Watermelon Strawberry and Basil Salad – a light and refreshing salad perfect for summer. Best of all, it’s so easy to make and ready in under 15 minutes. Made with fresh summer strawberries, peaches, pineapple and basil drizzled with a simple balsamic vinaigrette. 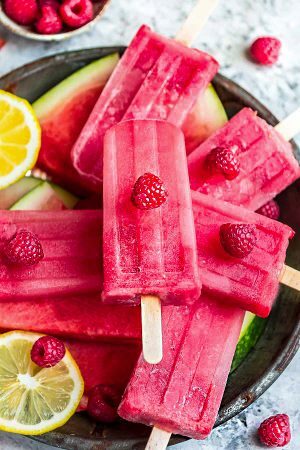 Watermelon might just be my favorite thing to eat this summer. Cold, juicy, refreshing and sweet all on its own. What’s even better? Toss some into a salad full of summer’s best in-season fruit. Salads happen regularly around here especially during the warmer months and this Watermelon Strawberry and Basil Salad is our latest favorite. It has so many good things I love about summer. You can’t beat how easy it is to put together. Just a few minutes of some easy chopping, and you can easily swap in whatever fruit you have on hand. 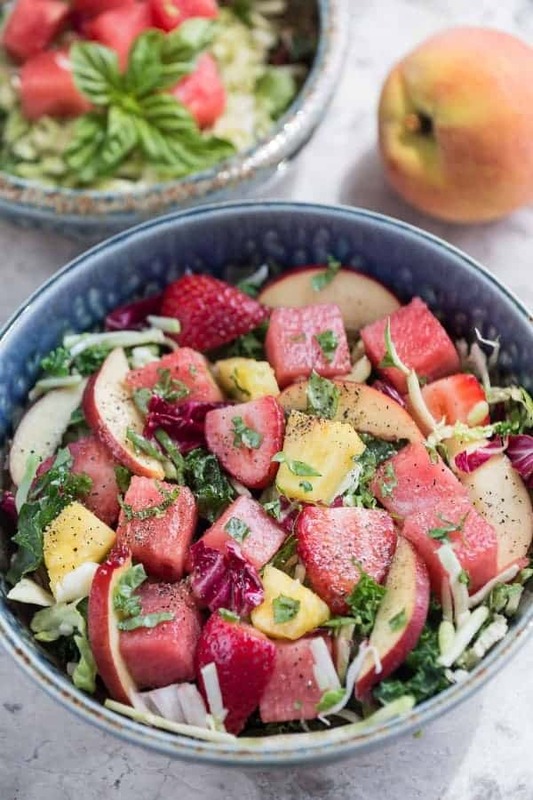 I loaded mine up with some sweet strawberries, juicy peach and tropical pineapples over a bed of finely chopped cabbage and kale. Arugula or spinach would also be great in here. As for the dressing, I made an easy 4-ingredient Balsamic Honey Vinaigrette. It’s just balsamic vinegar, honey, some Italian seasoning and olive oil. Simple, tart and slightly sweet and any extras can be stored in the fridge to use throughout the week. Just give it a good mix before serving. Finally, crumbled feta and chopped pecans are tossed in for some added texture and flavor. And to keep this dish dairy free and nut free, you can totally leave them out. This salad would make an awesome lunch or light dinner. You can serve it with your favorite grilled protein or bring it along to your next barbecue or summer cocktail party. Easy, refreshing and totally screams summer. 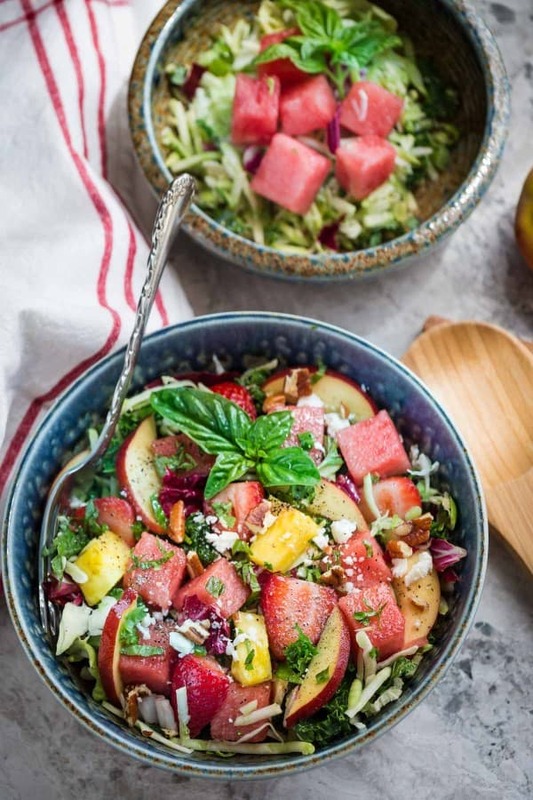 Watermelon Strawberry and Basil Salad - a light and refreshing salad perfect for summer. Best of all, it's so easy to make and ready in under 15 minutes. Made with fresh summer strawberries, peaches, pineapple and basil drizzled with a simple balsamic vinaigrette. For the vinaigrette: In a small bowl, whisk together all the ingredients for the vinaigrette. Season with salt and pepper and set aside in the fridge to chill ready to toss salad. Be sure to give it a quick stir right before tossing. For the salad: Fill a large bowl with the chopped kale and cabbage. Drizzle with half of the vinaigrette and toss together. Allow to sit for a few minutes for the leaves to soften. Add watermelon, strawberries, peach, pineapple and 1 tablespoon of basil. Gently toss and divide into bowls. Top with remaining basil, pecans, and feta if desired. Drizzle with additional vinaigrette and season with black pepper and salt. Serve immediately. It’s been so hot here and we’ve been buying a ton of watermelon too! Tossing it into this beautiful salad sounds marvelous! This is such a gorgeous salad, Kelly! I’ve never tried a salad with watermelon before, so I love the combo with strawberries and basil. And it sounds so refreshing, too! Just what I need for these super hot temps! Watermelons and strawberries are the quintessential summer fruits! Mix them into a salad like this, and I’m in (fruit) heaven! Love this, Kelly! Such a beautiful and flavourful salad! Well done, Kelly. Watermelon is one of my favs too, Kelly! And while I do love it on it’s own, this salad looks beyond! Talk about gorgeous!! And I am looooving how jam packed this beauty is with all the summer yum! Strawberries, peaches, pineapple AND basil? YES! The balsamic vinaigrette sounds like the perfect, simple, finishing touch! I seriously could eat this daily! Cheers, dear! Wow, you have really packed in the fruit in this salad Kelly! Kudos for that. It looks so fresh and summery and I could just devour a whole bowl. 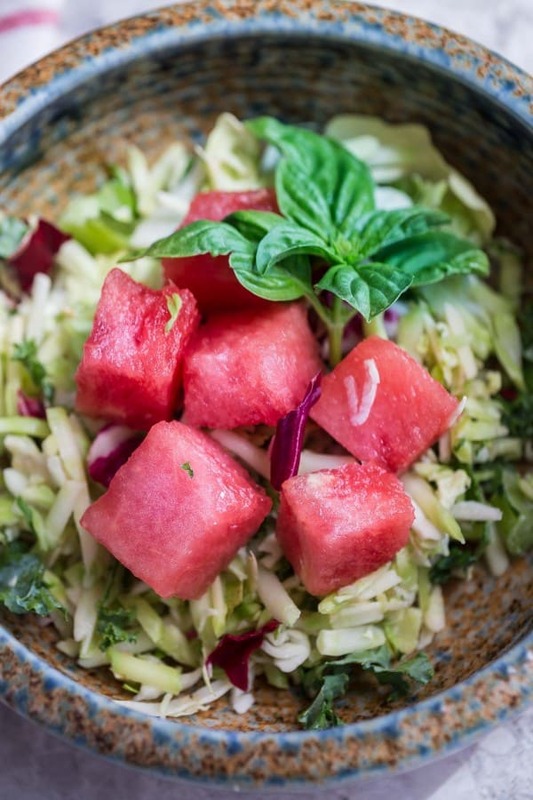 Watermelon has definitely been one of our favorite things to eat this summer too. This salad looks so gorgeous, Kelly! I love how easy it is to make too! 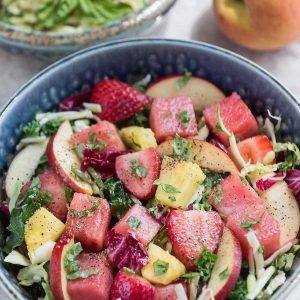 There’s so much summer goodness in this salad, Kelly, and it would definitely help me stay cool! 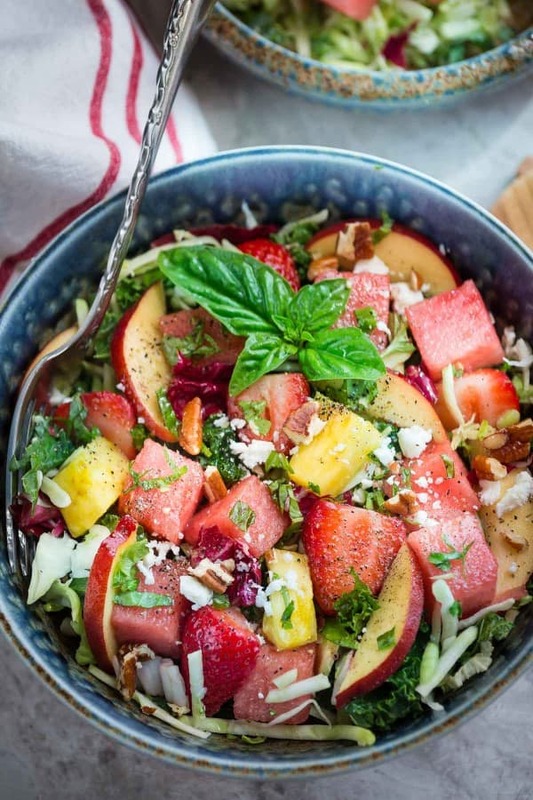 I love the sweet and savory flavors going on here — this is a summer salad at it’s finest! I LOVE using watermelon in savory dishes!! It’s like you made this salad just for me! 🙂 haha It sounds fantastic!! this is just beautiful, I love this salad Kelly, so fresh and delicious! This salad looks perfect Kelly! Can’t wait to try it! I can’t live without watermelon in the summer, I buy it all the time! I love salads that have watermelon in them! This looks like the perfect summer salad! What a refreshing, bright and fresh salad combination, Kelly! Totally out of the box for me and I know I would really enjoy it these days. I’m sure this is keeping you and your family nice and cool right now! 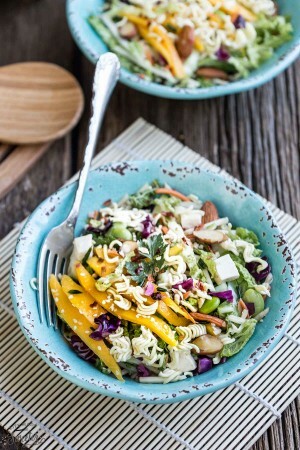 This is one seriously gorgeous salad, Kelly! We’ve been eating a ton of watermelon too, and it’s so perfect with strawberries and basil! Wow, this is sure a beautiful salad Kelly…so summery! I love the fresh basil in it!